Being produced by Alan Jackson’s long time producer Keith Stegall, it’s no surprise Craig Campbell’s self-titled debut offering is as real as real can be, full of southern family values and the everyday struggles of the average american while still finding time to have some fun. Starting off the album is I Bought It , whose first line sets the tone for the first three songs which touch on getting through tough financial times, with I didn’t have the money for that half-carat ring. Obviously, by the title you can guess where the song leads. He follows that up with the strong debut single Family Man which is currently residing in the Top 15 on the radio charts, and When I Get It which is about getting bill collectors and nagging ex-wives off your back. After the confidence boosting My Little Cowboy about a father’s pride in his son the album gets a little less serious. Starting with the fun Makes You Wanna Sang whose chorus is just a simple M-M-M-M M-M-M-M M-M M-M-M-M-M really does make you want to sing a long, or in this case hum. Then after the Clay Walker sounding That Going Away Look comes the tentative second single Fish which leads you to think a little naughty. Reminiscent of Keith Anderson’s “Pickin’ Wildflowers,” you know there’s a little more going on than what he’s singing with the opening line The first time we did it I was scared to death and great set-ups for the chorus like Man, I can’t even believe my luck/ I found a girl who likes to… fish. Next comes the upbeat summer song Chillaxin’ which puts a country spin on the hip term. Craig Campbell makes sure you know exactly the kind of country artist he intends to be with mentions of Haggard and Whitley, cowboy boots and pickup trucks. When the man in the latter of the above mentioned songs says If you gotta tell me how country you are/ You Probably Ain’t you should be realizing that Craig definitely is, at least on today’s country radio. The album then finishes with the playful All Night To Get There , written by Lee Brice, Stegall, and Vicky McGehee. 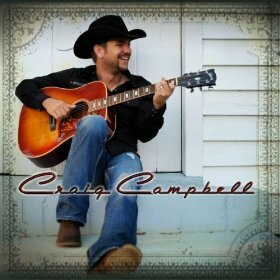 Co-writing 9 of the 11 songs on the album there’s no doubt Campbell knows his way around a country song. He may not have an Alan Jackson type career, but I think he shows enough on his debut to keep him around for a while.